Here at SFT we do love to hear all about your improvements and how your races went. If you could share a race experience with us, a result or an improvement we will be offering a prize for Swim of the Month. Charlotte G swam 22mins quicker at IM Austria last weekend compared to her best last year so that is not a bad starting point for July. Lucy added 90m to her T10 best at London Fields. Please add your results to the comments below and one will be selected for a prize. Goodluck! So I had Southend Tri few weeks ago, it was a dreadful day – windy, cold, didn’t rain but…my first proper sea swim! The water was choppy as hell, and despite having swam open water multiple times in many tris and otherwise, it’s a big fear I have. I entered the water and off went the whistle, I was practically “bricking it” – there was no way you could breathe bilaterally, and I am so used to it, I had to keep breathing just on one side the whole way through. Then on the way back – it was a one loop swim – the waves just became even bigger as it was closer to the shore! I put my head down and just kept swimming as if I was swimming for my life. I didn’t care about time, after seeing many pros who went in before me quitting only about 100m from the start, I was determined to succeed! And yes, I did! My normal time would have been 21-22 mins (for half a mile) but I was shocked to see that despite being battered by the waves, going off course I had made it in under 26min! I couldn’t believe it. The bike leg was hard too, so was the run, and I was shattered at the end of it, but happy to have accomplished the worst swim ever for me. 2 waves after my wave, the coast guard called the swim off. That is impressive! sounds a tough one! thanks for sharing. When is the next?? Hi – my swim relates quite nicely to your recent blog regarding why open water swim times can be more than the same distance in the pool. I have a severe case of pulling over to the left – in the pool I get bruised knuckles, in the open water I just end up being quite a long distance away from everyone else, who always seem a long way away on my right! So I was amazed when I saw the stats for my recent sea swim at the Sea Horse Swim at Studland Bay. Now either the course wasn’t a full 3.8k, my Garmin isn’t working properly or the most unlikely scenario I swam remarkably straight around the diamond shaped course (twice round) as my distance shows as 3.817k – that’s just 17m off a direct line and that included the finish which was on the beach and I forgot to turn off my Garmin as I collected my medal and water, that was probably another 6m which would make my course 3.811k. Given that my official time was 1.08.54, which would be a very good time for me, it proves what you keep saying (yes the coach is always right!) that if you swim the direct course you will get a quicker time than meandering from right to left and back again as I normally do! I have no idea why I swam so straight, they were nice big buoys but I still found them difficult to see amongst the swell, maybe the currents kept me on course, or maybe, just maybe, after a winter of SwimforTri coaching and fitness sessions my stroke is a little big more equal keeping me swimming in a straighter line – whatever the reason I was very happy with the result, coming 6th wetsuit lady overall. Nice work Tom, great time, well done, enjoy your down time. I did the 5km Dock 2 Dock on Saturday and completed it in 1h48min ☺️ the first 2.5km went very well but the second half was horrid with (very) heavy wind, it felt like swimming against tide… Although I wished for a fastest finish time, I was delighted by my ranking, in the top of the second third which is not bad for a second race! Congrats Audrey, those docks are tough! I suffered in there last summer! well done. After a bit of a dry spell I started competing again for Team GB in 2016 and was delighted by my first ever international podium position to take 3rd at the European Standard AG Duathlon Champs in Soria, Spain. The World Standard AG Triathlon Champs in Rotterdam were pretty tough with the swim taking me nearly 29 minutes I did a chasing to finally place 28th. I realised I had a lot of work to do on my swim to not start my races at the back of the grid. I trained hard all through the winter, and as soon as Swim for Tri started their Serpentine fitness sessions I was first in line. I did a lot of my training with Gui and even had a one-to-one session to really focus on some key stroke inefficiencies. My focus was the European Standard AG Triathlon in Tartu, Estonia on 21st July. After explaining to many of my friends, family and the Swim for Tri coaches that I was not expecting much (Duathlon – run/bike/run is much more my thing, I’m not much of a “swimmer”), but would be really happy to see a good improvement on my swim time from last season. Then I got the news that due to the high temperatures it was a non-wetsuit swim – my buoyancy, save energy on the leg kick device was taken away from me, disaster! I still find it surreal to explain what happened next… but I emerged from the water in a lifetime best of 23:55, just 2:30 down from the leading lady on my category – I had set myself up perfectly for the next two disciplines! My bike was strong (5:30 quicker than the next fastest time) and I only realised I was in the lead when I racked and found no other bikes there; I ran for my life to take first place, top of the podium in the European Triathlon AG Championships!! In no way a contender for swim of the month but a shout out for the Gower triathlon in South Wales (they host both standard and sprint and this w/e was the sprint race). 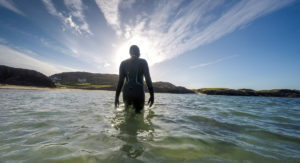 The swim takes place in the stunning Port Eynon bay. Normally it is sheltered from the prevailing south westerlies for a fast swim in calm water out one side of the well marked boat channel and back in on the other side. Yesterday we woke to a strong SSE ahead of the rain so it was a fight against the waves out to the half way buoy and every turn to breath caught a mouthful of the sea… But, as Dan knows, I love the sea – and learnt to swim in this bay – and it was my strongest leg of the race. The bike leg takes you to the very top of the Gower Peninsular with stunning views and the reward of a fab descent. The rain arrived in time for a slightly hairy return down the steep hill back to the village and was well set in for our run across the beach and back along a boardwalk through the dunes. But even in the rain it’s a stunning course and a well organised and marshalled event – I highly recommend it. Thanks Mary, always great to get feedback on good events that we can then recommend. Much appreciated. On Saturday night I swam the length of Lake Tahoe in California/Nevada in the USA in a time of 12hours 26 mins. This was over an hour faster than my previous best for 21 miles and this swim has the extra challenge of being at 6200 feet and in freshwater with no wetsuit, I beat the previous British record held be Kevin Murphy for 15 years by over 90 mins. Adding the Tuesday London Bridge session to my training plan has definitely been a winner and would recommend it to a swimmer attempting any distance swim including this bonkers one! See you Tuesday week! Great swim Mark, I know how hard you worked for this one what with the Erg sessions in the altitude chamber! wow that is dedication ! Stumbled upon a small triathlon in Ontario, Canada, last summer, and I was hooked. Determined to do my first tri the following summer, but there was one catch – while I wasn’t afraid of the water, I couldn’t swim front crawl. I started with blowing bubbles, teaching myself with YouTube videos and a couple of lessons until I showed up at Dan’s camp in Italy. Back in Canada, I spent the summer in jy wetsuit, hyperventilating, having panic attacks, and still not able to string together more than 50m at a time. But with the intervention and encouragement of Dan, Steve, and the community, plus finally some 1:1 coaching, I completed my first triathlon last weekend, a supersprint with a 400m swim. It was messy, and a fair amount of time was done on my back and in this weird sidestroke thing I improvised, but I did it! It took about 15 mins, but I was not last, not afraid, and positioned well to finish 5/11 in my age group. Most importantly, excited for next year! Fantastic work Cheryl, a great result for someone who worked so hard at their swimming. Just an update on how I’ve been getting on this year. June – River Arun 3.8k swim – 20 mins faster than two years ago. 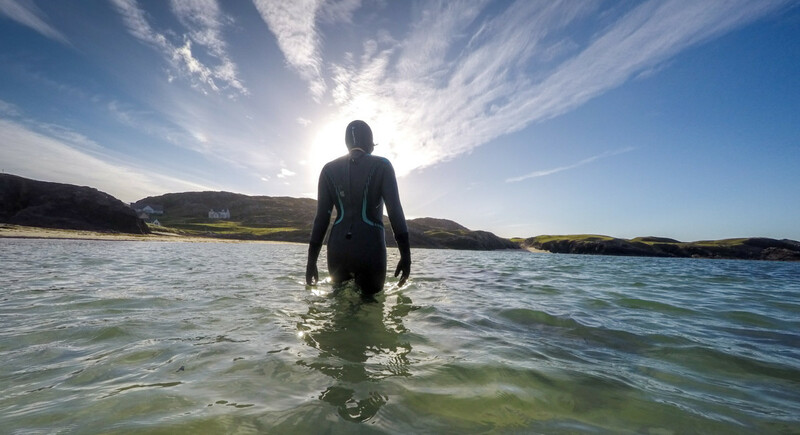 July – Longest sea swim to date . LCW wales around the IM cse. 20 mins taken off my time from two years ago and consistent within seconds for both laps. Actually swam abit further as sighting to the turnaround was impossible due to the sunset. August- Throughly enjoyed the Plymouth breakwater swim last weekend which was more about the mental challenge of having to swim in a straight line for such a massive distance . (that is massive to me) Enjoying swimming immensely at the moment. I even went on a cycling trip abroad and took goggles just incase we found a river to get in. The Seine was amazing. When my mind drifts just hear you saying tilt your chin or Maria telling me to raise my hips or check my hand placement which just makes me concentrate on my stroke abit more. I found the fitness sessions at Kings X earlier this year a great help albeit knackering fitting around work. I know I’m still not swimming enough each week as it’s so hard to fit in around 12 hr shift work. But seeing the gains I’ve had know that I can improve more. I’ll never been the fastest or best looking technique wise but I’m gradually improving. Maybe in a few years I may have a Dart 10k in me. Really pleased with the endurance gains this year. Dan , Thanks as always for your help , same goes for Maria and Nienke. Wonderful results Michelle, so glad your swimming is going so well. Very proud of you! Kicking off September with the 5k River Adur Fin Swim. This is such a fantastically run event and the second year of its existence. Admittedly it was an amazingly hot day so made the event and its setting at the River Adur Outdoor Centre even better. After the briefing we were taken up to the start in vintage double decker busses where we waited for all 150 competitors to gather before the claxon sounded and were were off. The ‘Fin Swim’ bit of it means that there is an option to swim the entire 5k with fins. I chose not to as I know I’d get cramp after a fairly short time, so opted for ‘regular’ swimmer. At the beginning of the race the tide was on the turn, so there was a definite ‘swimming against the tide’ for the first section of the race, but then after a while, this changed and we were speeding down the River Adur at a speedy pace. Last year the race was completed in 50mins for the entire course, but because of the tidal influences this year, the winner arrived back at the Outdoor Centre in 1hr 4mins with the last swimmer returning in just under the 2hr cut off. So, I was chuffed with my 1hr 17mins. The course is windy and the river is really wide at points, so sighting and lining up your quickest route is key. I swam an un-needed additional 250m, but in the scheme of things, not too bad. You do get a lot of people wondering about, but you get that at any event don’t you? The event is really friendly with very much a mixed-ability range of people competing. Would thoroughly recommend this race. Thanks so much to all at Swim for Tri for the coaching and long open-water swim sessions at Stubbers. Brilliant training for this kind of thing. Can’t recommend this event enough. Small, friendly, not very expensive, well supported, excellent in-water support, showers, loos etc… Thumbs up. Over the past 6 months attending the fitness sessions at Mile End, I’ve watched my technique slowly improve and my times come down. Back in July I swam the full 3.8km as part of the Heaver Aqua bike race and completed the swim in 1:42:49. With that in mind my aim was to try and complete the swim in Wales in 1:40, 1:35 absolute best. Mick and I completed the Dart 10k on Sunday. We’ve been swimming with you at Stubbers for a few years now but don’t consider ourselves swimmers. We just liked a dip in our local lake! However listening to everyones adventures inspired us to take things a bit more seriously. So taking on 10k has been a fantastic challenge. We’ve swam at London Fields in the snow, 20 odd degrees at Stubbers and 9 degrees in amazing waterfalls. Some of the training has been soul destroying (8km in Charlton lido), but overall it’s been a great adventure! Thanks for all your tips and encouragement. Hi guys, I hope the team at Swim for Tri are all ok. I just wanted to let you know that I did the River Dart 10k swim on Saturday 😝 who would have thought it. It was a massive challenge for me especially as I couldn’t swim a ssingle stroke of front crawl before I came to you guys. I followed Dan’s training plan and damn well did it. I am still quite slow and still don’t consider myself a swimmer 😂. Thank you for all your support, encouragement and wonderful coaching over the last few years. congrats Keely, keep practicing those tumbles!! When we talk about our most memorable swims, most of the time it is not the distance that is important, or even how fast, but what that particular moment in the water means to us. In September I was privileged to swim in the sea with a number of swim teachers who are part of the Panje Project on the Tanzanian island of Zanzibar. I travelled there for two weeks as part of a volunteer team, to assist the teachers. They have very basic facilities there – just the sea to swim in. Prior to our visit they were skilled in teaching basic water survival skills to local children. But we spent two weeks with them, training the teachers how to teach 4 strokes properly to the children (I’m a qualified swim teacher). To see their smiles in the water as they began to learn the new strokes, and to be in the water beside them, was more rewarding to me than any medal or record breaking swim. Best thing too is knowing that we have left a legacy behind, and these teachers will pass on their newly learned skills to a new generation, who will come to love the water like we do. Most importantly too, they will be far safer in the water and hopefully the drowning figures on this island will start to reduce. My swim of the month is the Swim Serpentine a couple of weekends ago in Hyde Park. First some background. I’ve been attending the SFT session in Walthamstow with Dan since it started over a year and a half ago as I had a prolonged knee injury keeping me away from running and someone in my triathlon club asked me why I wasn’t therefore swimming. When the session was advertised it was too good to miss – near my house, fitting into my working day and with such an amazing coach. Oh, and pretty much a brand new pool! At first an hour and a half starting at 6.30 am was as tough as trying to work a nine hour shift after it, but slowly things have slotted into place with swimming feeling more natural and the session energising me for the day. I have since felt part of a community, have swum in two charity swims and unbelievably the running came back for a swim-run event in Wales. The two mile distance beckoned for Swim Serpentine really because it meant I could get the London Classics medal even though friends had swum the distance the year before and got very cold, almost bordering on hypothermia. My wave was the last one of the day and it had been raining since the morning but I was feeling confident as I left home as I figured weekly swims at Stubbers had acclimatised me to the water temperature and my swim fitness should let me do the extra distance. I knew some friends in the earlier waves and also a few SFT swimmers, including Mustafa from the Thursday swims who was swimming the one mile distance, but I knew no one in the 3.45pm wave. However I stayed focused as I walked from the tube station, even putting on my hat and gloves as the constant rain was cold and I wanted to stay nice and toasty before the event. I passed happy swimmers leaving the park with medals round their necks – and often a hot drink! – and it seemed strange to be one of the last still to compete. I was a good hour early and watched the wave before me as they were checked for their identification number and timing chip followed by the race briefing. Suddenly I spotted a swimmer I knew, someone from my running club, and so I gave him a big shout of encouragement. I didn’t see Richard or Lou from SFT although I knew they were also in that wave. Everyone seemed really excited, if a little nervous, and soon they were off and heading out to the first buoys and around the lake and also the big colourful floating sculpture, The London Mastaba, to get back to the start for one mile and onto one more loop to make it two miles. Everything seemed very well organised and I didn’t hang around outside for too long but made my way to the dry and relative warmth of the women’s changing tent from where we ladies soon emerged with our wetsuits, and orange hats and joined the men similarly clad ready for our inspection and introductory talk. We were packed in quite tight as we waited and suddenly I heard a shout and there were Bernice and Lorraine watching for Richard and Lou from the covered spectator ‘Grandstand.’ It was so nice to get some support before I set off and it also meant I had a photo to remember the day by, taken by Lorraine. Thomas, from the Thursday morning sessions, had warned me that the beginning would be pretty busy and it was, but we soon spread out and I got myself into a rhythm like when I am at Stubbers. I had allowed myself the concession of a neoprene hat under my official one and so I didn’t feel cold as I went round, and as the buoys were evenly spaced and there were enough people to follow, I had no trouble with directions. As I passed The Mastaba, which is made up of tightly fitting bright oil barrels strung together, it was weird to get a smell of petrol, and it took me a bit of time to realise that it was in fact the fumes from one of the rescue boats rather than the sculpture itself. I had wondered before the swim if I would be bothered by all the bird droppings in the Serpentine having never swum there before, but instead we had petrol fumes although never too bad. I wasn’t trying to race as I went round but I did avoid the temptation to stop and it didn’t seem that too much time had gone by and I was onto my second lap. Good news and I was enjoying myself! I then got a second wind and had the experience of the first lap to take a more direct route. I followed nicely behind one swimmer until he took a wider arc and so I focused on imagining the route ahead and getting into the finishing straight. When the finish was in sight one swimmer came zooming past obviously keen for a sprint finish and so I thought perhaps I should do a mini version of that and soon I was under the gantry and out and up the ramp, a little unsteadily. I had done it! Many hands helped me out and then it was following through for the medals and goody bag and a quick dip in one of the hot tubs (wetsuit removed), which was lovely. Shivering, it was then quickly collecting my bag and straight in to change, eat the museli bar provided, grab a takeaway tea and head straight home where it was already quite late in the day and dark. I felt elated and suddenly completely shattered. It was only then I realised that although it was raining all day, it had stopped for pretty much all of our actual swim so maybe 3.45pm was the one to be in! I was chuffed with my 1 hour and ten minute time and learnt the next day that it was only one minute slower than Richard who, when he was swimming on a Thursday morning, always pushed me to swim faster. Two weeks later and one cold later swimming is again getting me through a slight running injury! Basically the escape from Alcatraz swim. Having been scared witless by friends and the posters in San Fran embracing Sharktober , the month when they welcome back the great whites to the bay, I felt it necessary to take out additional insurance and even write my will . Anyhow I survived to tell the tale. Currents were strong as to be expected , water temp was a balmy 16.2 , tropical compared to uk waters. It was a tough swim but a bucket list accomplishment. Took it nice and easy and made sure to take in the sights at numerous intervals of the crossing. Fantastic weather. A good end to a great swim year and an event I would highly recommend to anyone willing to travel that far.